Welcome to IPN: The Incident Page Network! IPN sends alerts on breaking police, fire and rescue incidents to your pager, cell phone or other wireless messaging device in real-time, as the incident is happening. With nationwide coverage, plus extended coverage in Canada and Australia, IPN is the worlds largest and most comprehensive breaking news notification network. Ability to select specific states, counties & cities to receive info from. Ability to specify the types of incidents you want to receive. Ability to specify the hours you wish to receive alerts. Option to have your notifications delivered in mixed-case or in ALL CAPS. Option to change the way your notifications are displayed, and the content of your notifications. This is useful if your wireless carrier limits the number of characters you can receive. Option to have messages stored during the hours you have turned off, and have them sent to you when your service becomes active again. Option to have notifications sent to both your wireless device & email address (additonal monthly fee applies). All changes to your account are made right here on our web site and take effect instantly. 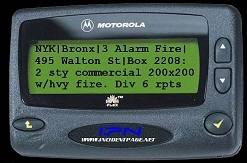 You don't have to send your pager in to have it reprogrammed just to change your settings with IPN! Sign up now to start receiving alerts instantly, or click here for some frequently asked questions about IPN. You can also contact our 24-hour tech support team with any questions you may have.